Photography has a lot to do with being in the right place at the right time. Whether that location is popular, hidden away, or generally ignored, it’s the photographer’s task to be there and capture a unique perspective through lighting, position, and framing. Sometimes, you stumble across a scene that is already set and waiting to be shot. In this case, it’s a sunset that the photographer knew he needed to capture, but he underestimated how beautiful the scene would be. Having the right equipment makes all of the difference in a situation like this! 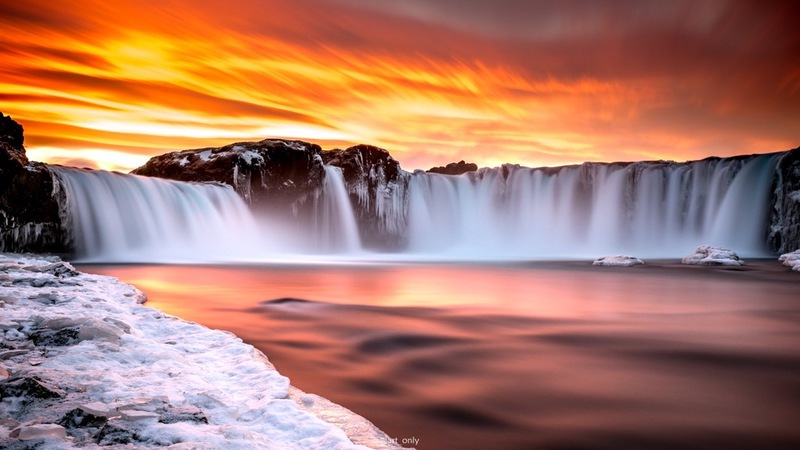 captured this stunning photograph of a sunset over the Góðafoss waterfall in Iceland. While road tripping, he arrived at the waterfall just minutes before this scene developed. 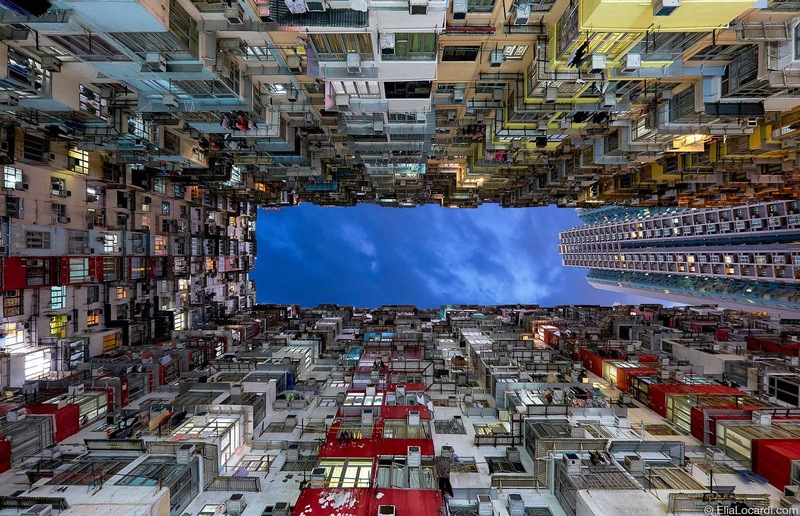 He used a Nikon D810 to capture it. His settings were a 167 seconds, 32mm focal length, f/11, and ISO 64. Nirenburg put a 10-stop neutral density filter on his lens to restrict the amount of light that entered. Combined with a long exposure time, the image smooths out the details in the whites of the image, including the sky, water, and ice. You’ve seen many a sunrise and moonrise, but unless you’re an astronaut, you’ve never seen an “earthrise” — a unique phenomenon that is only viewable from the Moon where the Earth appears to “rise” over the lunar horizon. 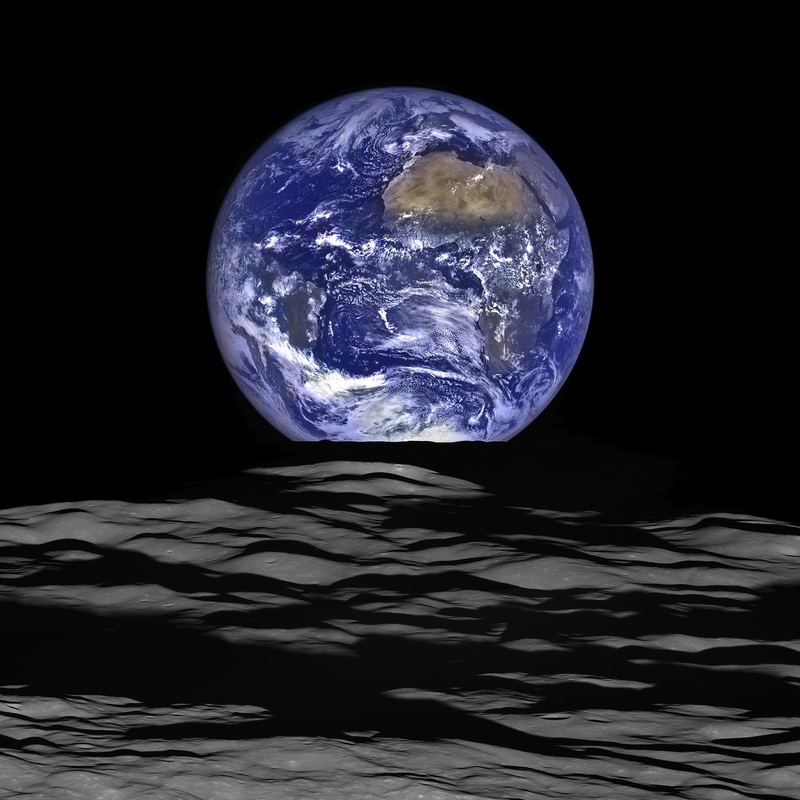 NASA has released several iconic earthrise photographs over the years — most notably in 1966, 1968, and 1972 — but none compare to LRO’s latest capture, seen above. Pictured most prominently in the image are Liberia, the Sahara Desert, and Saudi Arabia, as well as the Atlantic and Pacific coasts of South America and the Moon’s Compton crater. LRO was launched in 2009 and boasts not one but two powerful camera instruments. Its Narrow Angle Camera captures high resolution black and white images, while its Wide Angle Camera snaps lower resolution color images. Once these photos are recorded, NASA’s imaging team employs a complex series of post processing steps to combine them and produce high resolution photographs in both full color and detail. The water is surprisingly clear. You can easily see the beautiful rock formations rising high up and out of the water and the river bed strewn with rounded rocks. The image is surprisingly sharp and detailed. 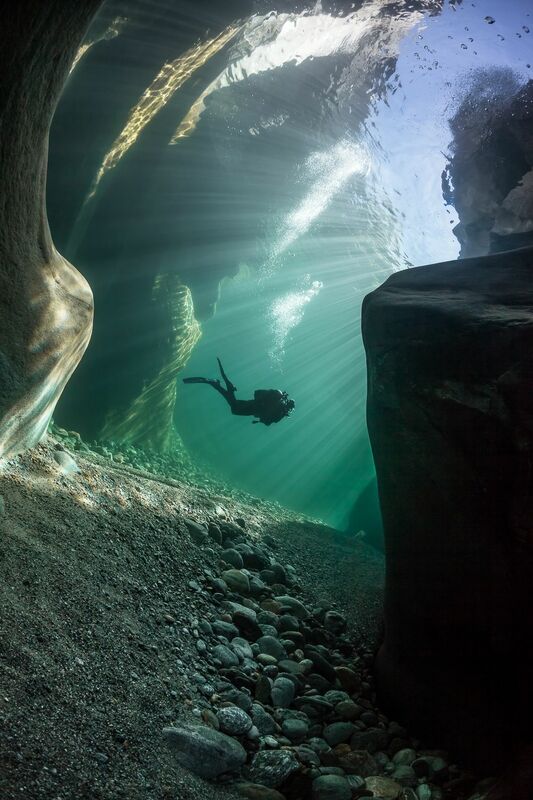 Beautiful sunlight streaming into the water makes for a lovely addition to the image. But what finally nails it is the silhouette of the lonely diver—like a lonely explorer exploring a mythical and dangerous place all by himself. 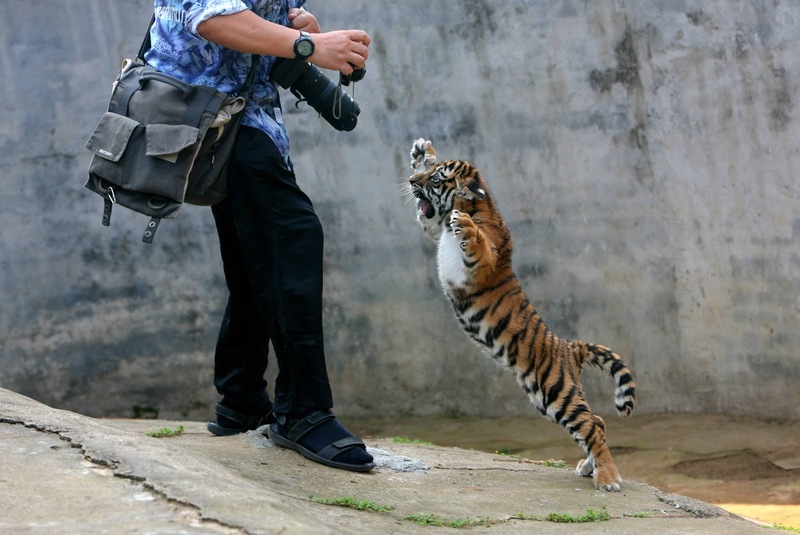 Despite his juvenile stature, the young tiger could still cause serious injury to the photographer. Just ask anyone who has ever been “playfully” mauled by an innocent looking kitten of the domesticated house cat variety. Even their tiny little claws and teeth can inflict serious pain. Being on the receiving end of a baby tiger lunge is almost certainly more painful—not to mention horrifying—than our initial reaction to this photos inherent cuteness may lead us to believe. 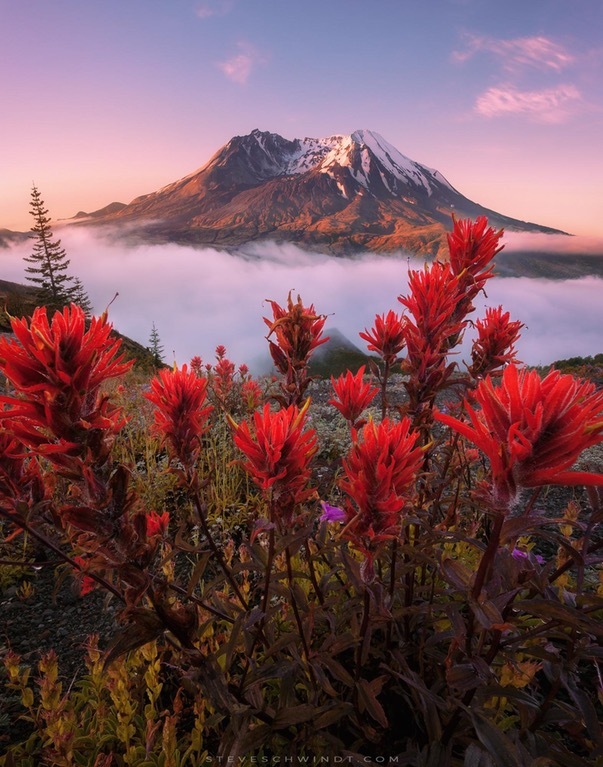 Photographer Steve Schwindt photographed these red wildflowers near Mount St. Helens in Washington. His patience paid off as the sun emerged from the clouds. Just then, the fog started clearing to reveal the scene before him and the rest is history. Steve used a Canon 5D Mark II camera with a Canon 17-40mm f/4L lens. In order to have the foreground and background in focus, he focus stacked 8–10 different exposures. His settings were 17mm focal length at ISO 100, f/9.0, and 1/5 second. Since picking up his first DSLR at the age of 14, Jones has been photographing the natural world—from the wild birds of New Zealand to bold coastal landscapes of Alaska. But it was after an excursion spent diving with sharks that Jones discovered his passion for underwater photography. 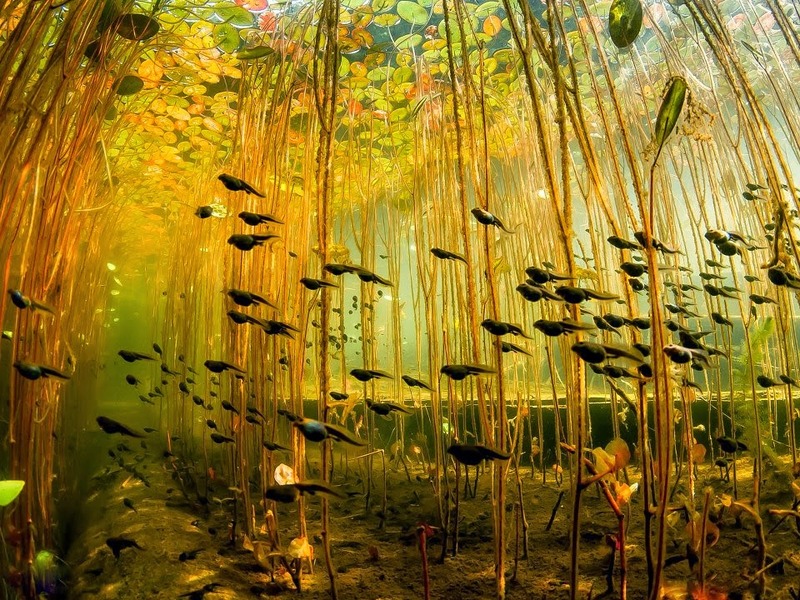 His surreal and dramatic images encapsulate the mysterious beauty found in nature, both inside and out of water. 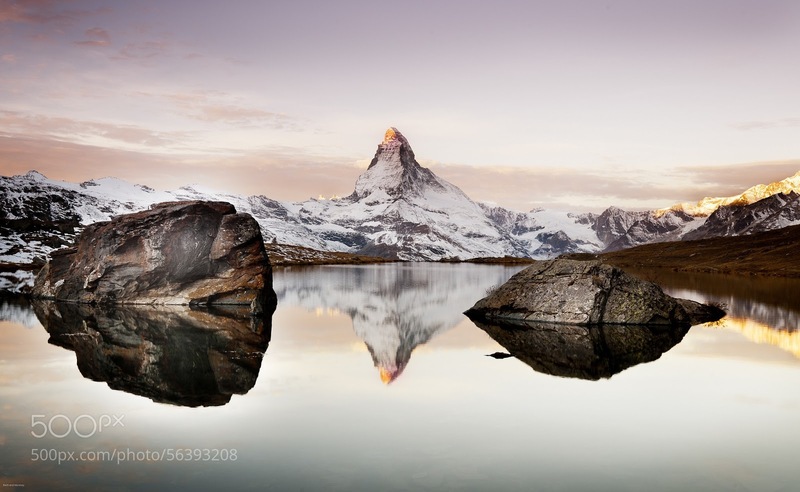 This shot was captured by photographer Bertrand Monney, who has a penchant for high-resolution otherworldly landscapes, both natural and man-made. Part of what makes this photo so awesome is its dark rocky foreground against an almost delicately light background–the interplay between textuality and light makes the composition way more interesting than if he just shot for the spiky mountain itself. Of course, the reflecting pool helps, too, as does every ounce of detail visible on the mount itself. There’s a reason why dogs have earned the coveted title of “Man’s Best Friend.” They’re loyal, they’re intelligent, they’re lively, and most of all, they’re downright adorable. Jasper, a Siberian Husky/Labrador Retriever mix from Alberta encompasses everything we love about dogs. With his favorite people by his side, he’s up for even the most daunting adventures. Among his ongoing portfolio of impressive escapades is this stunning photograph. 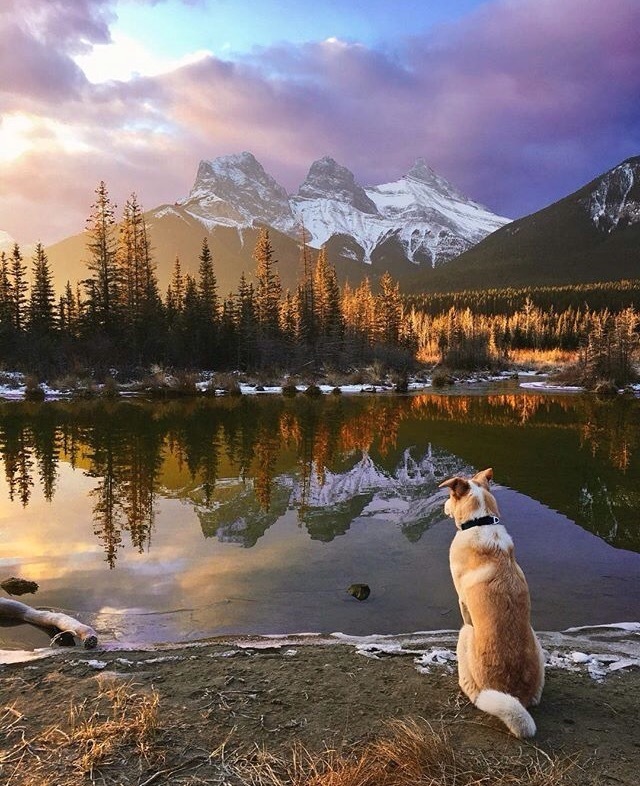 With the peaks of the Rocky Mountains reflected in the still waters of an isolated lake in front of him, Jasper almost seems to be meditating as the soft morning light floods the valley where he and his owners have set up camp. Of course, his best buddy Marti was at the ready and managed to snag this incredible shot. When Jasper shared the picture on his personal Instagram, his 17,000 followers raved. More than perhaps any other dog breed, Border Collies are highly task-oriented and need to experience a sense of purpose in order to thrive. Indeed, they tend to be notorious workaholics. This, in addition to their intelligence and agility, suits Border Collies to an active working lifestyle—and especially to guarding and herding livestock. Scully is actually one of Walker’s two Border Collie companions, and it’s clear that the dogs are some of Walker’s favorite art subjects. 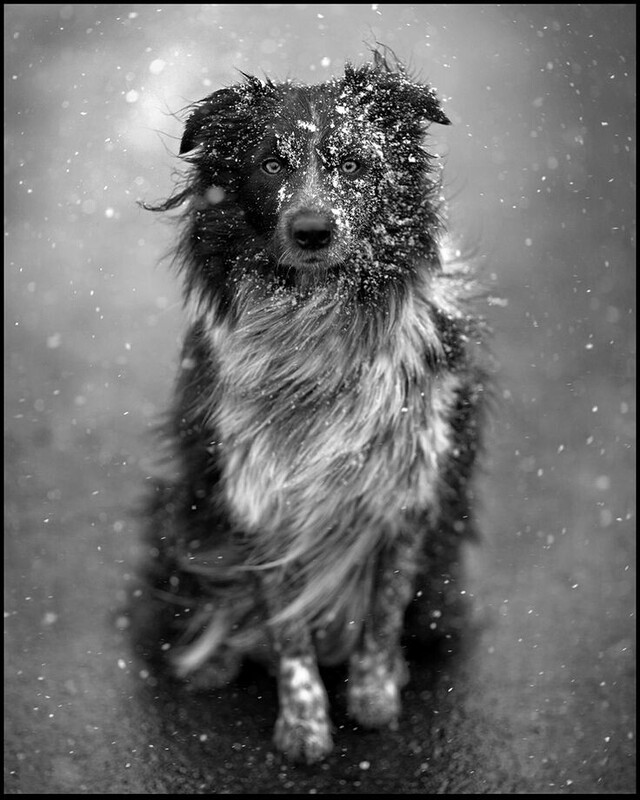 Images of one or both canines dominate his online print store selection. As something of a documentarian, Walker considers photography, and his art in general, as a means of experiencing life to the fullest extent possible and then recording meaningful moments in a way that causes viewers to reflect deeply on themes like time, adventure, loyalty, and love. Special thanks to PictureCorrect for posting these photos on the internet. These photos are copyrighted.